Biggest strength in 2016: The Dukes, always close but never the ultimate victors of the NEC, changed all that last season. They finally seized their chance after performing pretty much as expected in out-of-conference play, beating two sub-D-I opponents and Bucknell but falling to the eventual Pioneer Football League champions Dayton and Albany of the CAA. In league play, the Dukes cranked up the intensity and went 5-1, winning all three games at home and ending the 2015 season with a perfect 5-0 record. The strength of the Dukes was simply their statistic dominance over the rest of the league, leading in both total offense and total defense, a pretty good recipe for success. Biggest Challenge In 2016: Like one of their conference mates St. Francis, the schedule gets a lot more challenging for Duquesne, with games at Youngstown State and tough games at home version Dayton, Bucknell, and Kennesaw State. The key to the season will be to navigate those waters, and the bullseye on their backs in conference play. Biggest Departures: WR Chris King notched 1,136 yards receiving last year for the Dukes and also had 81 receptions in 12 games, averaging over 7 grabs per game. He wasn’t the only receiver that QB Dillon Buechel had to target, but he was his most often-used target, and he won’t be easy to completely replace. Players To Watch: Slightly behind King, however was WR Wayne Capers, Jr., who managed 804 yards receiving and 9 TDs. He’ll slide into the go-to receiver spot, but it’s who might emerge on the other side of Capers that might be the key to the Dukes’ season. WR Nehari Crawford and WR Reggie McKnight, who combined for over 500 yards receiving, might fit the bill, joining sophomore RB Rafiq Douglas (977 yards, 11 TDs) as a potent offensive skill squad. 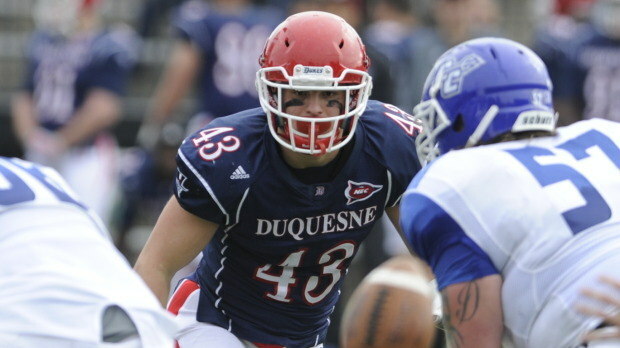 On defense, though, the dominant force that is LB Christian Kuntz returns at linebacker. The Pittsburgh, PA native had an incredible junior year, with 72 tackles and 26 tackles for loss, which led the nation last season. Less publicized was that he also led the Dukes in interceptions (4, returning 2 for touchdowns) and had six pass breakups, showing how much of an all-around force he is on the field. If he only approaches last year’s production, he’ll have a successful senior season and only wonder which NFL team might sign him. Biggest Game: at St. Francis (PA), 10/21/2016. Rooney field last season was very friendly to the Dukes, and their home games vs. Robert Morris, Bryant, and Sacred Heart at Rooney Field should all be great games. But it was that one slip-up on the road vs. Bryant last season that prevented them a perfect NEC record and added extra drama that led to the very end of their season. Oddly enough, that drama came against St. Francis (PA), a game that essentially was for the NEC championship, at home. This season, though, they play the Red Flash on the road in a game which had to be circled by every member of St. Francis (PA) from about January. The Dukes need to get past that game in Loretto and make sure that DeGol field isn’t the game where they slip up this time around and make for a dramatic stretch run in NEC play. Duquesne In Two Sentences: The Dukes won’t have it as easy this time around, but with so much talent returning on both sides of the ball, it’s hard to pick against them as NEC champions. And if there’s improvement from that talent, watch out. Tagged 2016, Championship Subdivision, Christian Kuntz, Dillon Buechel, Division I, Duquesne, FCS Football, Jerry Schmitt, NCAA, NEC, Preview, Rafiq Douglas, Wayne Capers Jr.